A power rack (also known as a power cage, squat cage or squat rack) is a piece of weight training equipment that functions as a mechanical spotter for free weight barbell exercises without the movement restrictions imposed by equipment such as the Smith machine. Its general design is four upright posts with two adjustable horizontal bar catches (also called "supports," "rails" or "pins") on each side. Many power racks also have accessory attachments, such as a chin-up bar, pulldown cable attachment, or pegs for storing weight plates. There are 3 types of power racks. A four-post rack features four large posts, a chin-up bar, safety spot bars and sometimes weight storage. A four-post multi-rack has shorter front posts and an open top to allow for standing overhead presses without restriction. Finally, there is a two-post half-rack that has an open design and takes up less space in the weight room. A number of attachments or accessories could be added to a power rack to increase the range of training options. The power rack was probably invented in the ‘40s by Bob Peoples, an American deadlift-record-holder. 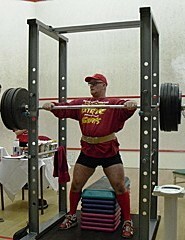 There is also evidence that weightlifter Paul Anderson used a homemade power rack. A newer form of power rack that was developed in the middle of ’90s, is the half rack. It utilizes two or four vertical posts (with cantilevered bar catches) that the user stands in front of, in contrast to standing in the center of four posts in a conventional rack. The first half racks were developed at the University of Nebraska. The power rack serves several purposes. Chief among them is safety: for instance, in the bench press, placing the bar catches right above the lifter's chest will prevent the barbell from crushing the athlete in the case of muscular fatigue or other loss of control of the bar. In the case of squats, catches placed just below the lowest position of the squat allow the lifter to "dump" the weight safely. ^ a b c d e Epley, Boyd (2004). "Facilities and Equipment". The Path to Athletic Power: The Model Conditioning Program for Championship Performance. Human Kinetics. p. 102. ISBN 0-7360-4701-8 – via Google Books. ^ Kiesling, David (January 13, 2019). "Power Rack Attachments & Compatibility – Master List". .tworepcave.com. Retrieved March 15, 2019. ^ Todd, Terry (January 15, 2010). "The Peoples Champion". H.J. Lutcher Stark Center for Physical Culture and Sports. Retrieved March 15, 2019. ^ Brooks, Collin (June 25, 2015). "'Mr. Deadlift' Peoples set records, invented weightlifting equipment". Elizabethton Star. Retrieved March 15, 2019. ^ Myers, Al (March 12, 2012). "Peoples Deadlift". USAWA. Retrieved March 15, 2019. ^ a b Starr, Bill (August 1, 2005). "Back to the Rack". Iron Man. Retrieved March 15, 2019. ^ Reader, Peary (1964). "Power Rack Training for Maximum Muscular Development". Iron Man. 23 (6): 22–27, 46. ^ Frantz, Jeff (August 13, 2016). "How York played a role in the steroid controversy". York Daily Record. Retrieved March 15, 2019. ^ Epley, Boyd. "Innovaton created the Strength of Nebraska" (PDF). boydepley.com. Retrieved March 15, 2019. ^ Stoppani, Jim (2018). "Strength Training Equipment". Jim Stoppani's Encyclopedia of Muscle & Strength (2d ed.). Human Kinetics. ISBN 978-1-4504-5974-7 – via Google Books. ^ Sloan, C.S. (June 1, 2001). "Rack It!". Iron Man. Retrieved March 15, 2019. This page was last edited on 16 March 2019, at 13:11 (UTC).